In addition to the orientation of the house, Oehler's underground buildings are unique because of their building methods. He calls his system PSP, which stands for Post/Shoring/Polyethylene. I'll write about the polyethylene tomorrow, but will explain the framework today. Basically, Oehler's houses are timber-frame structures sunk underground. He uses dried and de-barked trees (western cedar and lodgepole pine) that are six to twelve inches in diameter to form posts and beams, notching them together so they create a rigid framework. The inter-connected timbers hold back the force of the hillside because each wall is braced against the opposite side. The polyethylene layer that I'll mention tomorrow keeps most of the wood dry, but the bottom 2.5 to 3 feet of the posts are exposed to soil moisture. Oehler built his first houses by impregnating those portions of the wood with penta (a chemical preservative), which he no longer advocates. Now, he prefers to char the wood, cool it, then wrap each end with five layers of garbage bags. Unfortunately, his new method doesn't have as much longevity behind it, so you can't be sure how long it will last, but he does provide instructions for changing out the posts in an existing house if necessary. Homegrown Humus sums up my experiments with using cover crops to increase fertility in a no-till garden. You could splice the posts together from two kinds of wood; with the piece that goes into the ground being a rot-resistant wood like chestnut (Castanea sativa) or whatever is popular for this purpose in the US. In Europe high-grown european larix (Larix decidua) is popular for posts that have to stand in water. Making the splice is a job for a woodworker, though. Alternatively, pour some concrete in a hole (to slightly above ground level) to make a foundation for a post. Put the post on top of that foundation. Don't pour the post into the concrete; it will still get wet and rot. Put some steel angle profiles vertically into the concrete so you can later put the post in between them. -gotta wonder how the cost of timber construction, not to mention durability/stability/longevity issues, is worth it compared to concrete? 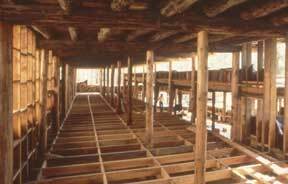 Even if you owned the woods and the trees were free,the labor investment in preparing the timbers is large. It will depend on the location and accessibility of the property. If you can get an excavator and concrete truck in, it'll be easy. If that is not possible, mixing the concrete locally would be a lot of work. And the resulting material would probably be less consistent. Personally I wouldn't even consider it if I didn't have a way of carrying the bags of cement and aggregate in by vehicle!